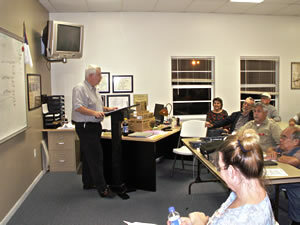 The MCARA Ham radio club has regularly scheduled meetings and activities in and around Stuart, Martin County, Florida. Incorporated to promote Amateur Radio and Emergency Communication Services, we are an American Radio Relay League affiliated club since 1978. We are organized under the Southeastern division of the Southern Section of the ARRL. We have available a new Color Optimized Brochure (1.8M PDF) for promoting our hobby, activities, community services, and club. You may also visit the League sponsored Hello Radio web site to learn more about ham radio. If you would like to get your ham radio license please contact us and we will get you with someone in your area who can lead you through the process. Be aware the FCC no longer requires knowledge of Morse code for any class of license. In a very short time- just a few weeks- you can be talking to people around the world. Find out how to become an Amateur Radio Operator by contacting our club today. Membership is open to all people with an interest in the Amateur Radio Hobby. If you would like to join us, please fill out our membership application online or join us at our next meeting to get a feel for our club.